The A27 westbound between Lewes and Falmer has reopened following an earlier road traffic collision. One vehicle was reported to have overturned in the incident close to the A275 Brighton Road between the Ashcombe roundabout and the Southerham roundabout, near Lewes, on Monday afternoon (April 2). The driver sustained minor injuries, according to a police officer who tweeted from the scene. Sussex Police, the South East Coast Ambulance Service and crews from the West Sussex Fire and Rescue Service have been sent to help the injured driver and to clear the road. 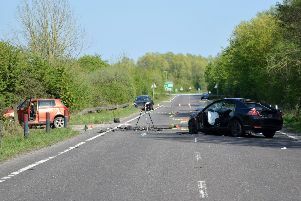 A police officer at the scene warned motorists of ‘long delays’ as recovery – which was on the scene – needed time to clear the incident. The road has now been reopened but delays are expected.